A funny thing happens as you age: time compresses. When I was 20, music from the 1940s seemed old. Robert Johnson was positively pre-historic, and to my ears the sound was equally cobwebbed. Oh, like everyone else, I bought CL 1654 after seeing it on the cover of Bringing It All Back Home and reading one of the breathless cover dissections in a magazine. Back then every cover prop "meant" something. But honestly, I didn't listen to it much. It was just too old for me. Besides there were living blues masters I could actually see perform and their records sounded better. Yes, lame. I admit it. But how many kids paying lip service sat and listened? Certainly the ones who were musicians looking to pick up licks (not that copying this guy is easy or even possible!). Suddenly you're older. Much older than 20 and you think about a 20 year old today. He'd think something from the early '90s was old! Maybe not as old as 20 years before 1966 since that's the timeframe for Nirvana's Nevermind and rock music hasn't changed all that much since then. Music from the '70s would be really old to that kid. Yes, I know, some college kids listen to the Dead and Led Zep. They're less "age-ist" than my generation, but then we gave them better music! So you get much older and then music from the 40s doesn't sound that old, especially when you pay attention and realize the "modern" stuff you loved from the '60s and '70s all came from what came before. Of course the wiser kids knew that all along, especially the ones who became musicians by listening, copying and then presenting to their peers all of this "new" music, the original versions of which most didn't have access to. Perhaps the reason Dylan remains "timeless" is because he always was. When he was a kid he didn't distinguish music in the context of a time frame. So listening to Robert Johnson's music now is a much different experience than listening 20 or 40 years ago. It sounds more modern and up to date. With perspective you realize how everything called rock and roll had at least some of its origins here. A whole lotta copying went on. Dylan, Keith Richards, Brian Jones, Hendrix, Clapton and the entire British and American '60s blues scene was galvanized by these recordings. Most kids though, couldn't care less. They were only interested in what their peers produced. In 1969 how many kids digging Let It Bleed knew or cared that Robert Johnson wrote "Love in Vain?" Ever since Johnson was "discovered" by boomer generation musicians there's been a mini-industry created around what were but 29 original songs (41 performances including outtakes) recorded in five sessions, three in November of 1936 and two in June of 1937, many of which remained unissued until the LP era. Johnson's actual recorded output consisted of 24 sides issued as 12 10" 78rpm records that were not widely distributed, making copies extremely collectible and valuable. Johnson was murdered August, 16, 1938 fewer than two years after he first began recording for Columbia's Vocalion label. He was 27, murdered in a juke joint, probably by the owner jealous of the attention the performer paid to his wife. Columbia issued King of the Delta Blues in 1961 as the LP format was beginning to become popular but not because it had hopes for big sales. The album consisted of 16 Johnson performances—a mix of songs some of which had not been previously issued. 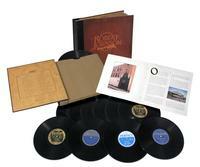 The packaging and liner notes hint more of historic preservation than commerciality. As the liner notes begin "Robert Johnson is little, very little more than a name on aging index cards and a few dusty master records in the files of a phonograph company that no longer exists." Volume II issued in the early '70s (Columbia C30034) consisted of 16 tracks, some repeated from the first album, but including "Love In Vain," "I Believe I'll Dust My Broom," "Sweet Home Chicago," and others that kids back then had become acquainted with from covers and originals that were little more than covers with different names. Columbia waited until 1990 to issue the two CD set Robert Johnson: The Complete Recordings that was the first time all of Johnson's performances had been assembled in a single package. Music critics and fans were rapturous. The reviews gushed about Johnson's supposed "deal with the devil," and the other otherworldly but overplayed aspects of his legend. More importantly they highlighted the more important aspects of his performing abilities and creativity: his dynamic swoops to whispers singing style, his slashing slide guitar technique and his ability to produce and control multi- rhythms that made him sound more like a multi-instrument assemblage than a guy singing and playing a solo guitar. They also noted his metaphorically salacious lyrics. "Phonograph Blues" is not about the guy's record player. And of course the reviewers nearly wept about the sonic improvement digitalization had wrought. In this rare case, they were correct. The original transfers for the LPs were seriously compromised in terms of sources and an unfortunate attempt to attenuate surface noise. The CDs definitely had more to tell. In October of 1990 sales had already surpassed 100,000 copies. By the time a monument to Johnson was unveiled in May of 1991 the set had sold an astonishing 300,000 plus copies. Johnson would have been 100 last May 8th so to celebrate, Columbia/Legacy decided to give the catalog another go round. Now you could be cynical and say it's all about the money and there's nothing left to be said or heard, but regardless, what's been done here has value, particularly since the 1990 double CD box set is old news to a young generation, scary as that might seem. 1990 was a long time ago! So this time, in an age of "free music" downloads the producers decided to "get physical," releasing this limited to 1000 edition deluxe package consisting of all of the music newly remastered on a double CD, a superbly packaged '30s style album containing reproductions on 45rpm vinyl of all 12 much sought after Johnson shellac '78s, along with a second double CD from the Victor vaults venerating the recording dedication of Ralph Peer, who, after beginning his career at Columbia and Okeh, where he pioneered field recordings (location as opposed to studio), he joined Victor Records, the recording division of Victor Talking Machine Company, which had recently switched from acoustic to electric recordings, calling their version "Orthofonic"—a term familiar to every audiophile. These obscure tracks were mostly recordings of Memphis area musicians recorded under Peer's auspices between 1928 and 1932. 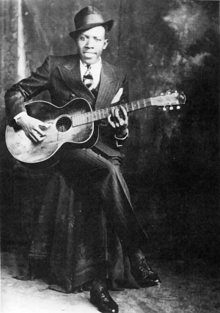 There are a few exceptions including Blind Willie McTell, performing here as "Hot Shot Willie" and calling himself "George Slim in duets with Ruby Glaze. My wife walked in while that was playing and asked if it was Willie Nelson. The vocal resemblance is uncanny. Most of these tracks were sourced from original metal parts, with but eight of them derived from pristine 78s archived at EMI's Hayes-Middlesex archives. However, also included on this second set are other recordings from the Dallas and San Antonio session that produced the Robert Johson material. Most of what was recorded during those sessions were hillybilly string bands or "Western String" groups like Bob Wills' Texas Playboys. Only one "race" performer other than Johnson had been invited to record during these sessions. In the original liner notes to Robert Johnson King of the Delta Blues Singers is this paragraph: " (Producer Don) Law also recalls that Johnson was an extremely shy young man. He asked him to play guitar for a group of Mexican musicians gathered in a hotel room (the Gunter Hotel, now considered a historic site) where the recording equipment had been set up. Embarrassed and suffering from a bad case of stage fright, Johnson turned his face to the wall, his back to the Mexican musicians. Eventually, he calmed down sufficiently to play, but he never faced the audience." "Possibly" this section's annotator Tony Russell writes, the Mexican duo Law mentions, might have been San Antonio's Berlanga and Montalvo, whose two songs recorded during those sessions are on this set, along with The Chuck Wagon Gang and The Light Crust Doughboys. Much of what this set represents, in both the annotation, the second CD set and the DVD, "The LIfe & Music of Robert Johnson, Can't You Hear The Wind Howl?" a film by Peter Meyer hosted by Danny Glover and starring Keb' Mo' as Robert Johnson, acts as surrounding musical and historical cushions for the main event. The film will fascinate any Johnson fan and includes clips from Robert Cray, Johnny Shines, Honeyboy Edward, Eric Clapton and Keith Richards, among others. It fills in the historical blanks and demonstrates what has been learned about Johnson and his times since the 1961 LP issue, the annotation of which says "Although little is known about Johnson...."
The heart of the new set of course is the album containing reproductions of the 12 original 10" singles, cut at 45rpm instead of 78 (the producers rightly feared that most buyers wouldn't be able to play 78s) and pressed on vinyl instead of shellac for obvious reasons. Some of the originals are extremely rare. All are collectible. All were originally issued on Vocalion but some were also specially issued on "dime store" budget labels Oriole, Perfect and Romeo, with three issued on Conqueror. The rarest is "Milkcow's Calf Blues/"Malted Milk" of which only 50 copies were pressed. The producers chose the Perfect label for that on in this reissue set. Producer Michael Brooks notes in his annotation that a WW II scrap metal drove caused RCA and Columbia to donate thousands of metal masters, basing which to save and which to scrap on popularity. A few Johnson metal parts survived and they were used to produce the original 1961 LP. In 1980 they were again used, this time sent to a freelance engineer for a sonic update and use in a movie soundtrack. He returned them but they were mis-filed and not discovered until 2008. Unfortunately, most these were takes that had never been issued on 78rpm. Only 4 of the 24 sides issued here on vinyl were sourced from those metal parts. Those parts were shipped to Harry Coster, a Dutch 78rpm expert who has a press in his barn. He pressed polystyrene copies, which were transferred to digital and then sonically enhanced (hopefully using the correct EQ curve!). Twenty original 78s had to be found. Eight were found in the Library of Congress and carefully played and digitized (probably using the Library's Simon Yorke transcription turntables). An English collector hand delivered 78s of some of the others to Mr. Coster for transfer and the well known LP anc 78 collector John Tefteller contributed "Love in Vain Blues," the rarest of the 24 78s. Otherwise, the set utilizes the original Frank Driggs flat disc to tape transfers from 1960 discovered in the Sony vault. These were flat transfers from 78s then only 23 years old and while they were noisy, they were deemed suitable for sound restoration. Ultimately, multiple copies of the original 24 sides taken from both disc and tape transfer were auditioned by Mark Wilder and Steve Berkowitz, who found, in addition to sound quality variations, speed variations that could have resulted from either the turntables used for the transfers, or from the turntable used in the original cutting. Slight voltage variations could cause speed variations of from 1 to 5 rpms. The 45s in this set were derived from all of the versions and speed-corrected as necessary. The booklet included in the double CD set is completely different from the larger one included in the record album and contain photos and excellent annotation by record collector, music historian and record producer Stephen C. LaVere. The section "A History of the Recorded Masters" is particularly fascinating and detailed. As noted in the annotation, the CDs here are mostly from new 24 bit disc to digital transfers produced by engineer Steven Lasker using CEDAR CAMBRIDGE software. Once they had been transferred to digital, another engineer, Seth Winner, removed noise, pops, clicks and other minor imperfections. In other words, this set includes two completely independent productions! One by Lasker and Winner for CD. The other by Michael Brooks and Steve Berkowitz for vinyl. The CD set differs from the 1990 production in another way: it's broken up by recording venue, with disc 1 containing the 16 San Antonio recordings and 6 alternate takes and disc 2 containing the 13 Dallas originals and 7 alternates including "test groove" recordings that occurred before actual takes. Also, the EQ was accomplished to produce greater consistency among the tracks. The vinyl was made from high resolution files produced from analog sources including tape and the 78s pressed in the Netherlands and then mastered at Nashville Record Productions. Plating and pressing was at United in Nashville. About the pressing quality: the records were uniformly well-pressed and quiet but came out of the sleeves dusty. Oh well, the music is old. A reader from New Zealand emailed to complain about eccentricity and warpage but the copy I bought (164/1000) didn't exhibit either problem. So which sounded better, the CDs or the LPs? Obviously the sound quality varies wildly within each format, but just for the hell of it, I compared "From Four Until Late" on the 10" and on the CD. First of all, if you have the original Columbia LPs, the sound on both versions here is dramatically superior, especially on top. The CDs sound superior to the 1990 go round too. As expected the vinyl sounds somewhat richer and warmer and better textured, probably as a result of being sourced from 96/24 bit files and a different set of EQ values aimed at vinyl. With this set you get to experience both, so what's the difference? When this was announced, cynics figured it was just slick repackaging to mark the 100th anniversary of Robert Johnson's birth, but clearly a great deal more care went into it to take advantage of improved digital processing and a greater awareness of how to properly use noise reduction. Between the annotation in both sets, the improved sonics, the 78rpm facsimiles, the bonus double CD and the very informative and well-produced DVD, I'd say I got my $300 dollar's worth, so it was disturbing to read a negative online review written before the set had even been released. That editor/publisher knows who he is and I wish he'd stop the nonsense. First doesn't mean best. In this case first meant wrong. I don't know how many copies of this limited to 1000 edition are still available (I see that one online vendor has sold out), but if you can afford it, you'll enjoy it and it's sure to become yet another Robert Johnson collector's item. our friends at retroplanet have an exclusive coupon code for the CVR Blog visitors! This is redeemable at the bottom of our online US checkout form. Coupon Code is Valid Friday Oct 14th 2011 through Oct 31st 2011. **Excluding item 19220 or any items listed as "Call for Pricing", large furniture items, or select items marked as discounted on our site. Coupon is for Online Shopping Cart orders only through our site checkout or our link to the amazon checkout. Coupons will not function with International Checkout Orders. Only 1 coupon code can be applied to an order. 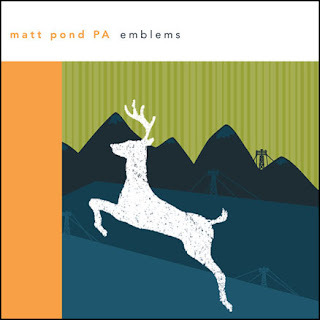 Pre-Order matt pond PA Emblems 2xLP - First Time on Vinyl! Emblems, one of matt pond PA's most beloved albums, is now available on vinyl for the first time and features three bonus tracks not found on the original release! The deluxe 2xLP is limited to 1000 copies on 180-gram vinyl. Pre-orders ship October 21. In stores November 1. All pre-orders receive an INSTANT full-album MP3 download at checkout. After touring together this past winter, matt pond PA and Rocky Votolato are back on the road this fall with another co-headlining trek. This time around they have a split 7" to commemorate their pairing. Pressed on clear blue vinyl (limited to 500), the split features one exclusive song each from two of this generation's most prolific and respected songwriters. 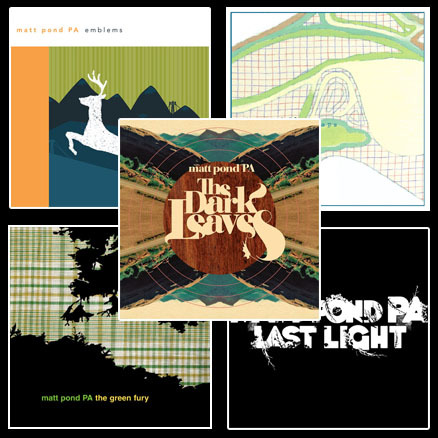 To celebrate the vinyl debut of Emblems, we are now offering a package deal featuring five matt pond PA albums (all on 180-gram vinyl) for one low price. 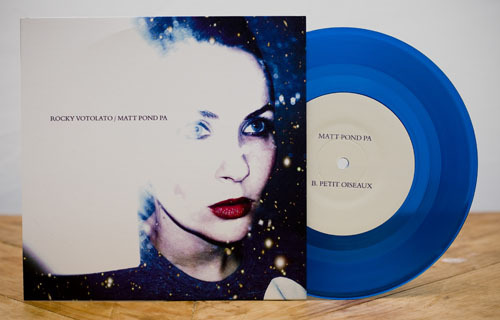 Each package includes a FREE copy of the limited edition matt pond PA/Rocky Votolato split 7" along with three posters. Plus, receive an instant MP3 download of every album at checkout. 5 matt pond PA LPs + FREE 7" Package Deal -- only $49! 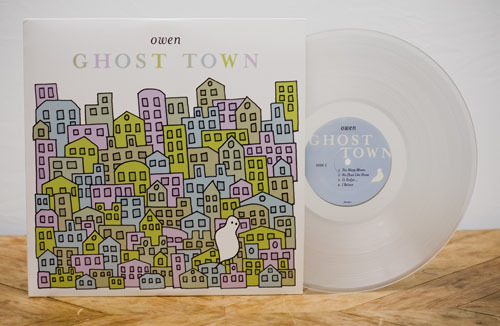 Pre-Order Owen Ghost Town -- Clear Vinyl is 2/3 Sold Out! Pre-orders will be shipping soon for Ghost Town, the new album from Owen (Mike Kinsella of American Football, Cap'n Jazz, Owls). But if you want to make sure your package includes a copy of the limited edition clear vinyl -- act now! Less than 1/3 of the pressing's 800 copies remain and will soon be sold out. All pre-orders receive an INSTANT full album download at checkout and include a FREE button, sticker, and two digital bonus tracks. Pre-orders ship October 28. In stores November 8. 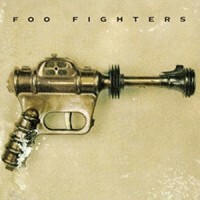 Six Foo Fighters Vinyl Pressings! Chuck Ruff, the American rock drummer best known for his drum duet with Edgar Winter and THE EDGAR WINTER GROUP on the 1972 No. 1 hit instrumental "Frankenstein", passed away in San Francisco, California on October 14 after a long illness. In 1977, Ruff joined Sammy Hagar and performed on the albums "Street Machine" (1979) and "Danger Zone" (1979), including the song "Bad Reputation", which is featured in the film "Fast Times At Ridgemont High". "Napalm Records is very proud to announce that the legendary Swedish doom metal legend Candlemass has joined their ranks. The band is currently working on material for their farewell album, which is tentatively scheduled for a spring 2012 release." Candlemass commented on the signing: "Now it is official, Swedish doom 'meisters' Candlemass have signed with Austrian Napalm Records for their 11th and last studio album. The band is very happy and excited about this and are looking forward to work with such a great and growing label as Napalm, home of cool bands like Monster Magnet, Karma To Burn, and Isole." In 1955, Buddy Holly opened a show for Elvis Presley in Lubbock, TX. In 1958, Jackie Wilson recorded "Lonely Teardrops", which went on to become his first US Top Ten hit, reaching #7 on Billboard's Pop chart and #1 on the R&B chart. In September 1975, while performing at the Latin Casino in New Jersey, Wilson collapsed from a heart attack and a stroke right in the middle of this song. He never recovered and remained in a coma for eight more years; he was hospitalized until his death on January 21, 1984 (age 49). In tragic irony, the last words he sung before collapsing were "My heart is crying." The audience at first thought that his fall was part of the act and they started applauding and cheering. It became evident that something was wrong when about half a minute later, he hadn't moved. The excitement instantly turned into confusion and shock as attempts to revive Jackie on the stage were to no avail. It is a 1999 Grammy Hall of Fame Inductee. The song is ranked #308 on Rolling Stone magazine's list of The 500 Greatest Songs of All Time. In 1960, Ringo Starr fills in for Pete Best when The Beatles play back-up at a recording session for Rory Storm and The Hurricanes' guitarist, Wally Eymond, in the small Akustik studio in Hamburg, Germany. Nine copies of a song called "Summertime" were pressed onto 78 RPM acetate discs, though none are known to have survived. It would be nearly two years before Ringo would join John, Paul and George on a permanent basis. In 1963, the Rip Chords record "Hey Little Cobra", which features Doris Day's son Terry Melcher on lead vocal, with the high harmony added by future Beach Boys member, Bruce Johnson. The record will enter the Hot 100 next January and reach #4. In 1965, Jimi Hendrix signed his first recording contract, he received $1 and a 1% Royalty on all of his recordings. In 1968, Led Zeppelin made its performance debut in England. In 1971, it was almost a blessing in disguise when Rick Nelson played the seventh annual Rock 'n' Roll Revival Show in New York. He thought he was being booed for not playing his old hits and came away with the inspiration to write what would be his last Top Ten hit, "Garden Party", which would climb to number six in 1972. It was later revealed that the crowd was booing some trouble makers who had started a fight and were being escorted out of the building. In 1973, Keith Richards was convicted of marijuana trafficking in Nice, France, receiving a suspended sentence, fine and ordered not to return to France for two years. Also in 1977, The U.S. Supreme Court refused to review a 1971 Federal Communications directive that broadcasters censor from the airwaves songs with drug-oriented lyrics. "Slip Slidin' Away," by Paul Simon (with the Oak Ridge Boys providing background vocals), was released in 1977. In 1977, Debbie Boone's first single, "You Light Up My Life" reaches #1 on the Billboard Pop chart, where it will stay for 10 weeks. It would go on to win a Grammy Award for Best Song and 21-year-old Debbie is named Best New Artist. The record only made it to #48 in the UK. In the 1980s she focused on Country music, resulting in the #1 hit, "Are You on the Road to Lovin' Me Again". She later recorded Christian music, which garnered her four Top 10 Contemporary Christian albums as well as two more Grammys. if i ever hear the song again, i will turn to stone! In 1979, Abba played their first concert in North America when they appeared in Vancouver, Canada. 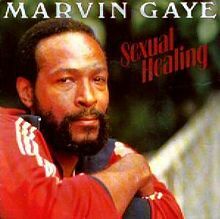 In 1982, Marvin Gaye's "Sexual Healing" enters the Billboard R&B singles chart on its way to number one. The song would also make the Top 10 in the UK and the Hot 100 and later win a Grammy as Best R&B Male Vocal Performance of the Year. In 1988, UB40 went to #1 on the US singles chart with their version of the Neil Diamond song “Red Red Wine,” also a #1 hit in the UK. In 1996, Ralph Middlebrooks, trumpeter for The Ohio Players died at the age of 57. The band reached Billboard's Top 40 eight times between 1973 and 1976, including two number ones, "Fire" and "Love Rollercoaster" in 1975. In 1997, Michael Jackson played the last date of his HIStory Tour in Durban, South Africa. In 2003, Mike Smith, the former lead singer of The Dave Clark Five suffered a fall at his home in Spain that left him paralyzed from the waist down. Smith would die of pneumonia on February 28th, 2008, less than two weeks before the band was to be inducted into the Rock and Roll Hall of Fame. In 2008, Jon Bon Jovi demanded that the John McCain campaign stop using the Bon Jovi song Who Says You Can't Go Home at rallys.